A total of 55 entries turned out for the inaugural 2014 World Poker Tour Alpha8 Bellagio $100,000 buy-in no-limit hold’em super high roller event, building a prize pool of $5,395,500. 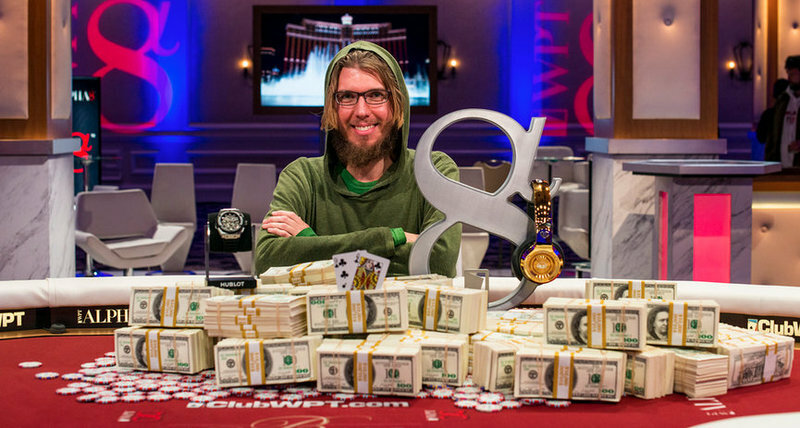 From that field made up of poker’s elite tournament professionals and wealthy poker enthusiasts Andrew “luckychewy” Lichtenberger emerged victorious, earning $2,104,245 and his first live tournament title in over three years. In addition to the money and the title Lichtenberger also scored 600 Card Player Player of the Year points. This was his fourth final table finish of 2014, including runner-up finishes in a $50,000 high roller at Aria and a $5,250 event at the L.A. Poker Classic and a third place showing in the $5,000 six-max no-limit hold’em event at the World Series of Poker. As a result of this most recent win Lichtenberger climbed to 44th place in the overall POY standings with 2,465 points and $2,859,290 in year-to-date earnings. Going into the final day Lichtenberger was second in chips of the eight players remaining. Only the top six would cash, with Brandon Steven eventually being eliminated on the $323,730 money bubble. Lichtenberger survived to heads-up play against Tom Marchese with just over 56 percent of the chips in play. The two battled it out for 44 hands before a winner was finally decided. On the final hand the two got into a raising war that ended up with all the chips in the middle preflop. Marchese raised to 300,000 from the button and Andrew Lichtenberger three-bet to 900,000. Marchese four-bet to 1.9 million total and Lichtenberger moved all-in, having Marches covered by Marchese quickly called with the 8 8 and was in for a race against Lichtenberger’s Q 9 . The board ran out J 4 4 K 5 , giving Lichtenberger a flush to secure the pot and the title. Marchese was sent to the rail as the runner up with $1,240,965 and 500 POY points. This was his third final table finish in 2014, all top-three showings in super high rollers and all for seven-figure paydays. After this latest cash Marchese brought his year-to-date earnings total to $4,013,216. Third-place finisher Brian Rast earned $755,370 and 300 POY points at his ninth final table of the year. He now sits in 34th place in the POY race with 2,658 points and $1,869,283 earned so far in 2014 in live events. Photo courtesy of WPT / Joe Giron. Why does Lichtenberger looks like a cross between a leprechaun and a hippie?